MISSOULA, Montana, March 18, 2011 (ENS) – An agreement that would remove federal Endangered Species Act protections for gray wolves in Idaho and Montana and return management authority to those states, while retaining full protection in Washington, Oregon, Wyoming and Utah was reached today between the federal government and 10 conservation groups. The agreement settles ongoing acrimonious litigation over the August 2010 decision of the U.S. District Judge Donald Molloy in Montana to reinstate Endangered Species Act protections for gray wolves in the northern Rocky Mountains. Wolves were officially delisted in Montana on May 9, 2009, but the federal delisting decision was challenged in court by the conservation groups. The states of Montana and Idaho an hunting groups intervened in the lawsuit to support federal delisting efforts. Conservation groups argued that state agencies have been too aggressive in killing wolves and that wolf populations are not yet back to sustainable levels. The states argued that they need hunting seasons to control the growth of burgeoning wolf populations. The settlement was filed for approval with the U.S. District Court in Montana. The parties are requesting that the court allow the 2009 delisting to be reinstated in Montana and Idaho on an interim basis, in accordance with approved state management plans, until a full delisting can be completed for the northern Rocky Mountain wolf population. The parties are agreeing that they allow these steps to move forward, up to and including a potential delisting of Rocky Mountain wolves, without resorting to further litigation. Under the settlement, the Service has agreed to address the delisting of wolves in the region in the future as a distinct population segment, rather than on a state-by-state basis. The settlement also requires the Interior Department to withdraw a controversial policy memo used to justify not protecting imperiled species throughout their entire range. Separate negotiations are ongoing between the Service and the state of Wyoming in an effort to reach agreement on a management plan for wolves in that state. If a mutually acceptable management plan for wolves in Wyoming can be developed, then the Service will be able to proceed with delisting proceedings addressing wolves throughout the northern Rocky Mountains. The 10 conservation groups that have agreed to the settlement are Cascadia Wildlands, Center for Biological Diversity, Defenders of Wildlife, Greater Yellowstone Coalition, Hells Canyon Preservation Council, Jackson Hole Conservation Alliance, Natural Resources Defense Council, Oregon Wild, Sierra Club and Wildlands Network. “We hope today’s agreement will mark the beginning of a new era of wolf conservation in the Northern Rockies, as well as confirm the success of the Endangered Species Act and this country’s boldest wildlife reintroduction effort in history,” the groups said in a joint statement. At least 566 wolves inhabit Montana according to the 2010 annual wolf conservation and management report released March 11 by Montana Fish, Wildlife and Parks. The state’s minimum wolf population increased about eight percent in 2010, compared to a four percent increase last year and an 18 percent increase in 2008. “I’m certain we could have successfully reduced the wolf population in 2010 if we could have proceeded with our planned, science-based hunting season,” said FWP Director Joe Maurier, announcing the new population figures. In 2010, wolf numbers in Idaho dropped slightly to 705, a drop that Maurier says may have been due to the state’s decision to reel in monitoring efforts in central Idaho’s rugged wilderness areas. 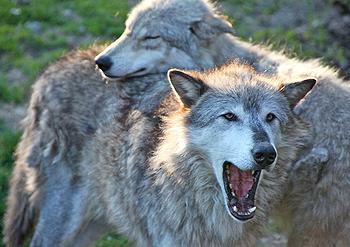 The 2010 count shows that 343 wolves inhabited Wyoming, up slightly from 2009.